As the complete guide for any rugby fan, Rugby News has been the authority on our national game since 1970. Award-winning journalists and international correspondents continue to provide insight, analysis and coverage on all aspects of the game, from local grassroots rugby through to the Rugby World Cup. In February 2019, the magazine increased in frequency, from six issues a year to 10, each with the same 100-page format. 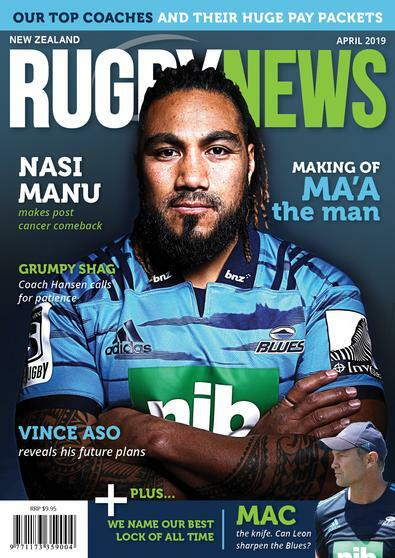 Every magazine is filled with the most highly anticipated interviews, features and insights and covers all aspects of New Zealand rugby – from schools and club rugby through to profiles on All Black and Black Fern superstars. Phil Gifford, Ian Jones, Melodie Robinson, Liam Napier and other industry insiders provide our readers with knowledge and trustworthy opinions on the game we all love.